Food Bites with Dr Hyman. Raw honey or pure maple syrup; are they good sweetener substitutes? 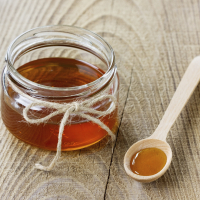 A prudent reminder from Mark Hyman that even though we are not cooking our whole foods up with toxic white sugar, we still need to be careful around our use of pure maple syrup and raw honey. You know that I use both of these sweeteners in my treats. I feel that the amounts are small compared to how much white sugar I used in baking a few years ago. I react with a shudder of horror now when I read everyday recipes that call for a cup of sugar! So I am continuing to challenging myself to always think about how to cut the sugar in treats further. And remember always that they are treats and not for everyday. Read more of Mark Hyman’s blog posts.